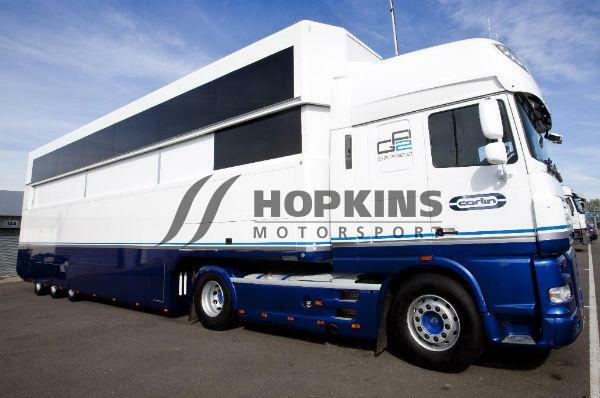 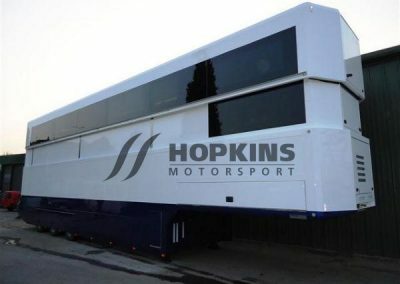 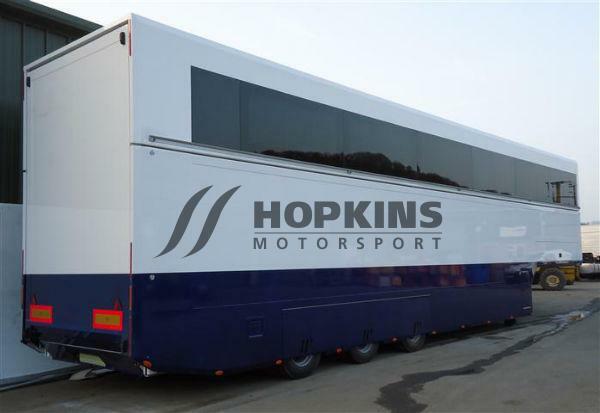 The 1st pop up roof transporter we built in 2010 for Carlins entry into GP2. 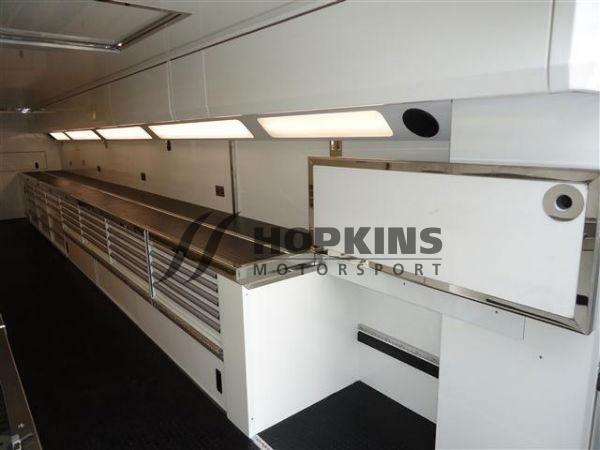 The layout can be used to carry up to four formula cars, complete with workshop, management office and usual HMS refinements. 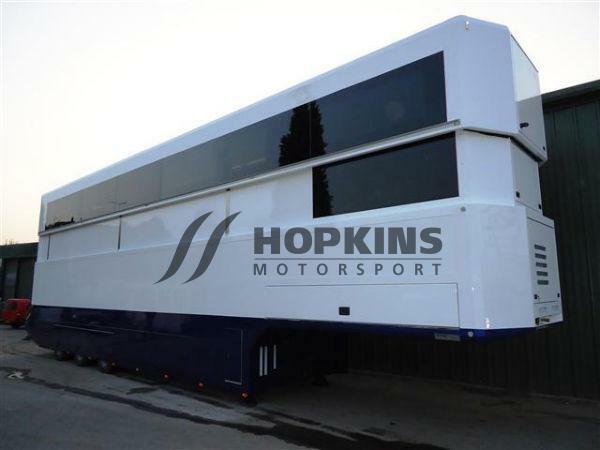 This design has evolved since 2010 to include the 328 & 366 refinements the design/layout can be adapted for a multiple of formulas, in this configuration it can carry 2 x GT cars on the top deck and 2 x Formula cars up to and including GP2. 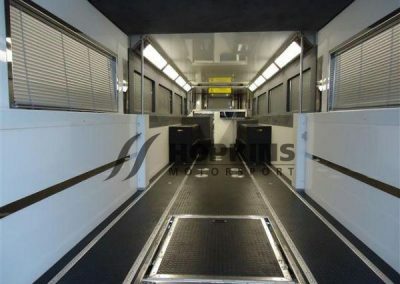 The transporter can be changed from car transporter to circuit operations vehicle in under 20 minutes, including lifting the roof, installing all partitions and setting up the satellites etc. 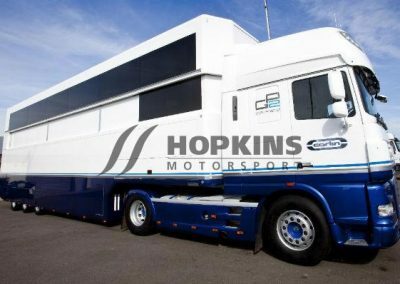 External: 13.6m x 4m travelling height race transporter, 2,500kg 2 tier dhollandia Tail lift, 13 kva marine application generator, hydrovane compressor, self seeking satellite, wireless internet, HMS hydraulic pop up roof, 2 x 13m x 8 awnings. Pop up roof to give 2.2m when projected. 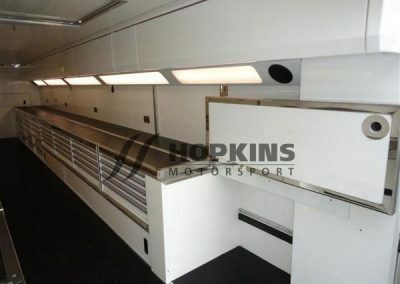 Workshop: The workshop area has a fixed height of 2m and will carry 2 cars of a maximum height of 1.1m, full length overhead lockers on both sides fitted lista’s on both sides, folding bench’s at the rear for storage of FIA refuelling rig if required. 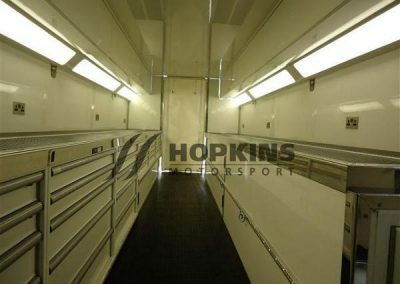 Removable partition to form drivers sleeping area if required. 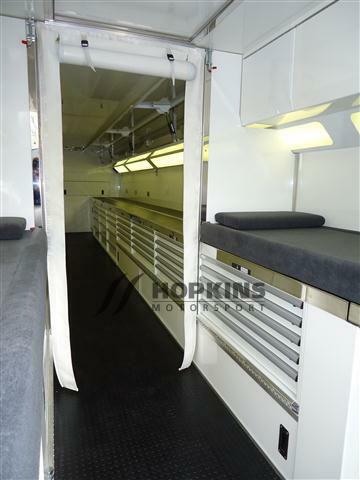 Top Deck: The top deck has a 1300mm height when travelling that will allow for the storage of 2 cars or flight cases and pit equipment. 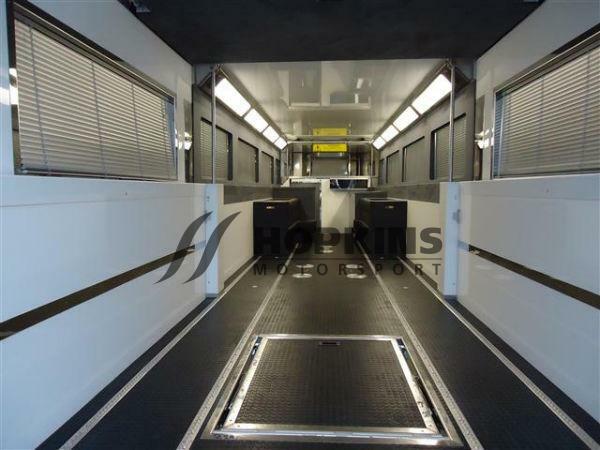 In circuit configuration it forms an engineers office for 12 people and a separate storage area length approx 3m. 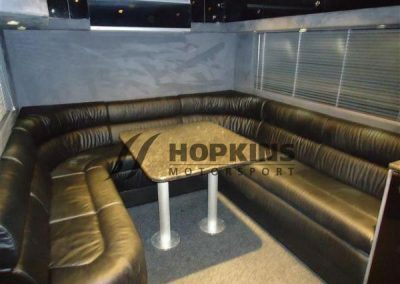 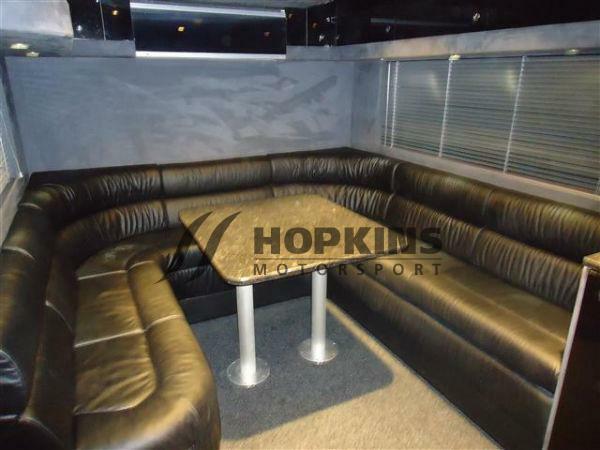 All the table and seats are removable to maximise loading space, this area is also fitted with circuit data TV’s and satellite TV, remote printers, air conditioning. 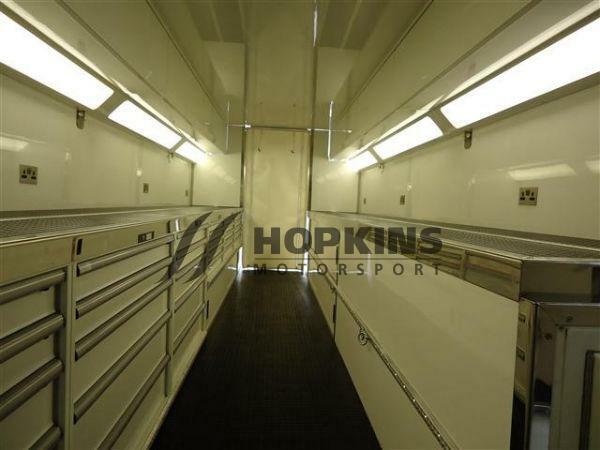 Management office: On the goose neck is a management office that functions with the roof up or down, external storage lockers are below the office. 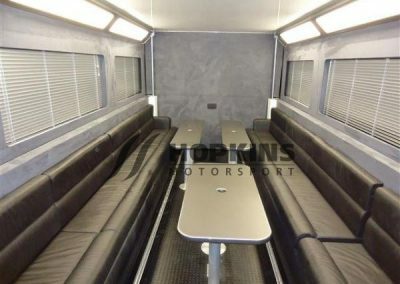 Individual air conditioning, satellite, removable table for additional storage, leather seating, sued walls as per the engineer’s room. 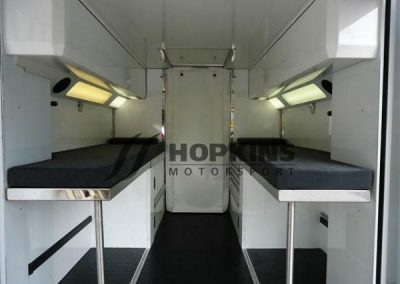 Drivers room: In under 5 minutes a separate room can be installed at the rear of the workshop that can act as beds or seating for the drivers.